(2) Secondary: Grades 9-12 and valid in middle level school grades 5-8. 1) Contact your local legislators. Send your local legislators a quick email or post card. One idea is to send them a message of congratulations if they won last fall. 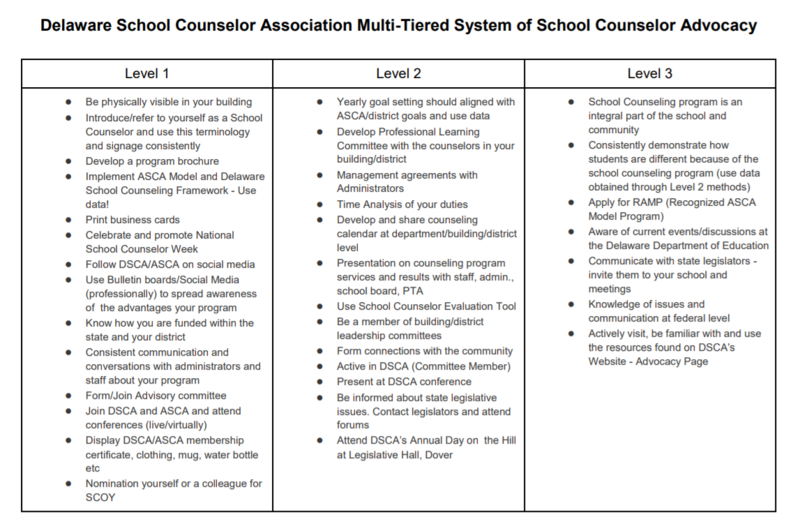 Introduce yourself and tell them you are a school counselor in their district. Let them know what you do as a counselor, that you'll will be contacting them again and that you hope to meet them at our "DSCA Day on the Hill" in January. The first step is all about building relationships. Here is the page to look up who the senators and representatives are for your district. The correspondence does not have to be long. It is recommended that you keep the communication short and to the point. It is recommended that you use a private email address for communication with legislators. This ensures that your correspondence and efforts are private and do not conflict with or represent those views of your school district. 2) Attend your local legislative forums. Become involved and be present! You will especially want to go to the meeting that has an Education focus. We will be sending out emails with information on where to find the meeting locaitons and times, but you can also ask to be notified in your email to your local legislators for the information about the forums. 3) Please use "School Counselor" instead of guidance counselor on ALL or your mailings, signs and signatures. Please visit the link below for an explanation of this shift in terminology.